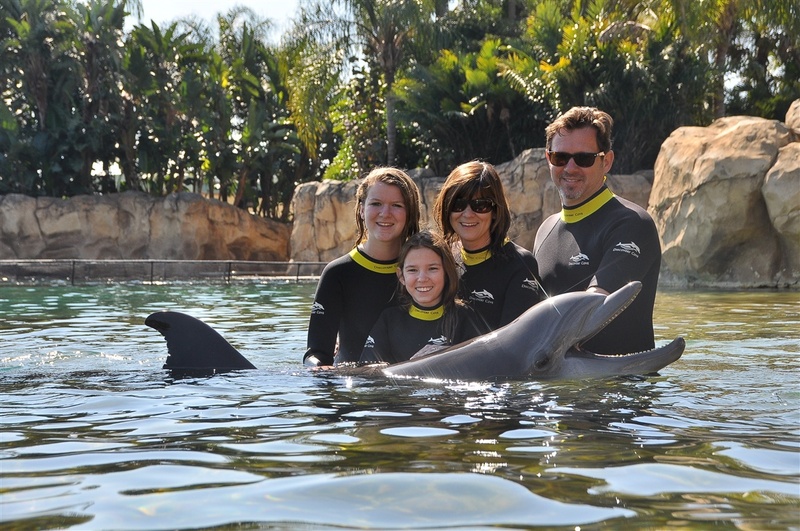 During the sub-arctic March weather we experienced here in DC, Sheara and I had the good fortune to escape to Orlando with our girls for spring break and experienced a wonderful opportunity to interact with dolphin at Sea World’s Discovery Cove. A splendid place for all to spend a day (none of those dreaded Disney lines – only incredible interactions with sea life, such as dolphin, sharks, otters, rays and beautiful tropical birds). A special shout out to Jess who was our dolphin trainer for the day, and introduced us to Astra (pictured here), Diego, Tyler, Hutch and other amazing dolphin. Jess was awesome and gave us a magical behind the scenes tour of this one-of-a-kind theme park. Like many, I grew up watching re-runs of the TV series Flipper, starring the incredibly intelligent and zany bottlenose dolphin who was the companion of Warden Ricks’ two young sons Sandy and Bud. I enjoyed watching Flipper protect the wild inhabitants in the Coral Key Park and, after nabbing the no-good thugs, celebrate with those amazing acrobatic flips and joyously vocalizing the triumph of good over evil. Flipper seemed to have the perfect life, free dinners, positive interactions with caring humans, and an opportunity to live free in the ocean. So upon visiting Sea World, I was admittedly a wee bit conflicted over the whole captive v. wild conundrum – here we were, paying to have these beautiful, incredibly smart, and energetic creatures perform tricks for us in this wonderfully designed yet completely artificial environment. At one point after being pushed through the water by the bottoms of our feet, I leaned over to Jess and whispered “do they really enjoy doing this?” I was hoping she would offer an emphatic and unequivocating “yes,” but she gave a thoughtful and probably more accurate response. What I appreciated learning is that these dolphins are never forced to perform or interact and are free at any time to simply swim away from we obtuse humans if they do not wish to interact. Jess went on to explain that, just like humans, dolphins are social creatures and have good and bad days, and while most days the dolphin are eager to interact, there are other days where they are less so. The trainers continuously assess signs of sociability or aggression, and will select only those dolphin who are eager for interactions. And while I’ve always resisted the tendency to project or ascribe human emotions to animals, these creatures appeared to be having as much fun as we humans and “enjoying” the attention and time spent together – sort of like our Golden Retriever doing tricks for treats and seeking out the affection of anyone around. The “Fish Kitchen” was particularly impressive – this is where every morning the culinary needs of approximately 100 dolphin are meticulously prepared with restaurant-quality fish. On a dry-erase board appeared all their names with an individualized diet of not only the total quantity of fish (ranging from 18 to 24 lbs), but diets broken down by fish species, such mackerel, herring, or sardines, depending upon the caloric and dietary needs of each dolphin. We weren’t allowed to take any photos, but when we visited the kitchen, it was bustling with trainers who were busily scrubbing down the stainless steel sinks and countertops, washing floors and walls, and, like great chefs, prepping food for the guests next feast. This experience reinforced my view that the positives of theme parks, such as Sea World, and animal captivity far outweigh the negatives, particularly in terms of the educational value regarding wildlife and habitat conservation and the impact of pollution on the environment. One area of particular concern which was notable in Sea World exhibits, is the threat of plastic debris littering our oceans. A good description of the extent of the problem can be found here and here in this NYT piece. While most of this ocean debris poses an aesthetic assault on nature’s landscape and human sensibilities, some of it can be lethal to ocean-bound critters. For examples, seals and sea turtles often mistake plastic bags for a favorite food item, jelly fish, which can and often result in death. Entanglement in plastic fishing line and nets is also a real problem. I am also reminded of this footage of a wild dolphin in Hawaii that recently went viral, where the dolphin, entangled in fishing line, seeks out help from a few humans who had temporarily entered his world. Roger Scruton, the political conservative and author of How to Think Seriously About the Planet, which I’ve discussed previously here, calls non-biodegradable plastic packaging a form of “immortal rubbish” which poses real ecological disaster unless abolished or systematically recycled. While manufacturers of consumer goods will play a prominent role in helping to advance more sustainable forms of packaging, the Clean Water Act has obligated many coastal communities to develop trash TMDLs (a/k/a total maximum daily loads or “too many damn lawyers”) and install trash gates at stormwater outfalls to prevent plastic debris from entering the marine environment. This is one in Bayonne, NJ, which I recently visited. After each rain event, the nets at the bottom of this vault will be emptied and replaced with new nets. However, we still have a long way to go to fixing this problem. There are many local volunteers and conservation organizations who work hard to prevent pollution from degrading our oceans and waterways. One of those local heroes is Rob Weltner, President of Operation Splash, who I have had the pleasure of getting to know over the last couple of years. Since 1990, Rob and his team have been doing the Lord’s work of educating the residents of Long Island regarding the harmful impacts of stormwater and trash on the estuarine ecosystems. 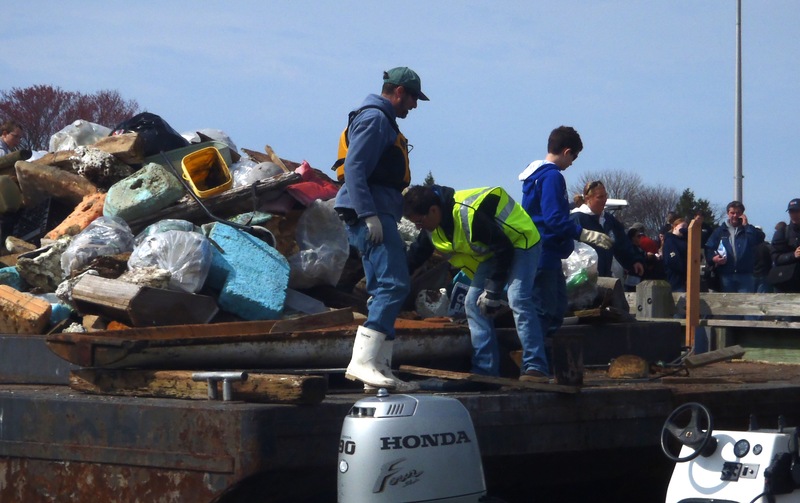 Rob and his dedicated platoon and network of volunteers have cleaned up hundreds of tons of trash along the beaches of Long Island and implemented programs aimed at preventing ocean pollution. To me, these folks are unsung heroes and go about their noble efforts out of sight and under society’s long and often destructive shadow. And we in society owe folks like Rob and his team a debt of gratitude for their passion and the hundreds of hours of volunteerism toward making our planet, oceans, and communities a more sustainable, safer, and enjoyable place to live. Free-market Environmentalism - Creating Sustainable IncentivesDo We Really Need a New Shade of Green Environmentalism?